Maxi Cosi 2wayPearl Car Seat + 2wayFix Base Duo Pack is an innovative and complete Car Seat system. It includes state-of-the-art safety features for children from 9kg to 18kg (approx. 9 months to 4 years.). These safety features comply with the new i-Size European safety regulations. 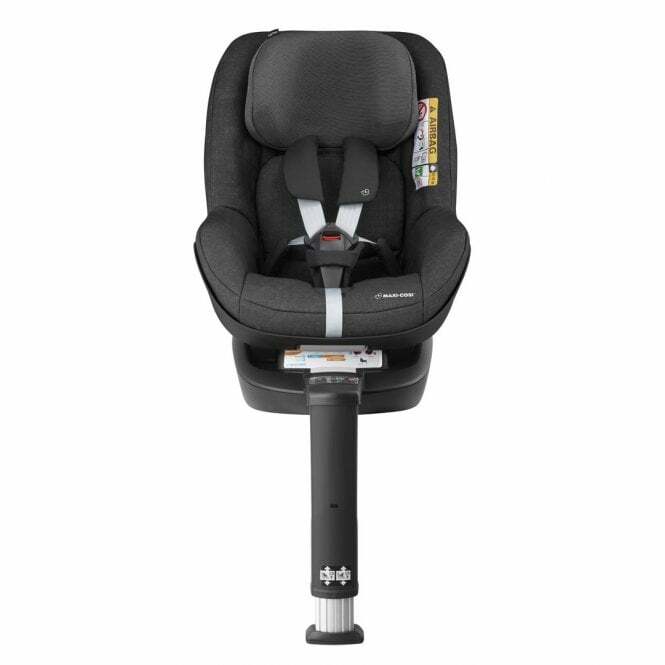 This pack includes the Maxi Cosi 2wayPearl Car Seat and the Maxi Cosi 2wayFix Base. Why should I buy the Maxi Cosi 2wayPearl Car Seat? The Maxi Cosi 2wayPearl Car Seat is suitable from 9kg to 18kg (approx. 9 months to 4 years). This car seat is approved according to the latest European safety standard i-Size. This car seat allows children to travel in the recommended extended rearward facing position until they are 4 years old. If you wish, the 2wayPearl can be used for forward facing travel from approximately 15 months to 4 years old - this is a guideline only from Maxi Cosi. What's more, both rearward facing and forward facing have full recline options. This allows your little one to sit back and have a nap if they wish to. It's also incredibly easy to switch between forward and rearward facing positions, making life easier for parents. This compact, safe and stylish car seat by Maxi Cosi includes an innovative easy-in harness. This stays open to easily get your little one in and out in seconds. Also, the one-pull harness adjustment makes this car seat incredibly easy to operate. The Side Protection System (SPS) provides the best protection in any side collision. To make things safer, this car seat is installed in the car by using the 2wayFix Base. This base attaches to the ISOfix fitting points in your car. As your little one grows, the headrest and harness can be adjusted simultaneously. As well as this, the 2wayPearl has a compact and modern design that fits into most cars! Why should I buy the Maxi Cosi 2wayFix Base? The Maxi Cosi 2wayFix Base connects the Maxi Cosi 2wayPearl to your car's chassis using the ISOfix connectors. Suitable for use from birth, this car seat can be used with the Maxi Cosi Pebble, Maxi Cosi Pebble Plus, Maxi Cosi CabrioFix, Maxi Cosi Rock and Maxi Cosi 2wayPearl. The light and sound indicators of the 2wayFix Base provide feedback of correct installation for peace of mind. The installation feedback confirms a valid length position of the adjustable support leg. If that's not all, the installation feedback also informs parent to switch off the frontal passenger airbag travelling rearward facing. It also informs you to not to place baby forward facing before turning 15 months. The compact and modern design means that the 2wayFix Base can fit into most cars with ISOfix points. The Click and Go release button helps to easily remove the car seat. It is also used to change the 2wayPearl from a rearward to forward facing position. A low battery warning signal flashes on the 2wayFix Base when the energy drops below 30%. The 2wayFix still functions on an empty battery, however replacement is highly recommended in order to retain the light and sound safety check. What are the specifications for the Maxi Cosi 2WayPearl Car Seat? What are the specifications for the Maxi Cosi 2wayFix Base? Which car seats are compatible with the Maxi Cosi 2wayFix Base? Is there a Manufacturers Warranty included with the Maxi Cosi 2wayPearl Car Seat + 2wayFix Base Duo Pack? Maxi Cosi offer a Lifetime Warranty if purchased from 1st January 2016. You must register your product within 3 months of purchase. If this is not applicable, a 2 year warranty applies. This applies to UK Mainland only. Your Review - Great seat and base - very good safety features! The green lights are very helpful when you're putting the seat in and changing it around. We are still using this seat rearward facing and he's very content inside. It's easy to put and strap him in and I know that he is in the safest place he could be which is very reassuring. Buying the base and seat together was also handy and it included everything we needed.